From Injury to Triumph... Craigie Gene's greyt story!! Craigie Gene... This is his story. Gene was purchased a couple of nationals back from Steven & Julie Everett Boyd. In the mornings, Gene was looking fantastic! We couldn't wait to get him rolling official around the oval! Gene official schooled at Flagler & would continue on to official races after a couple of great qualifiers. He climbed the ladder in an impressive fashion - we were THRILLED that this goofy lovable kid was shining so bright! Gene was drawn into his first Grade A race on August 20th, 2013... it was time to run with the big dogs. When the box opened, Gene took a bump from one of his rivals & finished several lengths behind the pack. Gene had broken his right hock. We were located in Miami at the time, but decided that Dr. Ogden at Bonita Veterinary Clinic would be the place to take Gene. (He was ready & willing to see Gene immediately) After a comfy ride in the backseat of the car, James arrived at the clinic in Bonita. Gene received amazing care. He had surgery to correct his hock & returned home to the kennel with us. Several check ups and cast changes later, Gene was cleared for cast removal! It wouldn't be anytime soon that he would start running again. It took several weeks of keeping a close eye on the way he used his back right leg. Gene started back slowly...taking walks throughout the compound. Next, it was time for some "truck walks" to get him moving at a little bit of a faster pace. We were very impressed with the way Gene was progressing - on to the sprint path!!! After months of slowly working back, he was gradually let run farther & farther around the oval during his morning schooling hand slips. Now in Bonita, racing at Naples/Ft. Myers, CRAIGIE GENE is back!!! It took him a few starts to get back into the swing of things, but he finally had his chance to WIN HIS GRADE A. We are so proud of our boy & felt that maybe by sharing his story, you all would be able to feel a little bit of the joy that we have today! The pictures below include two of his x-rays, pictures of James & Sarah with him at the vet, the chart from his first ever grade A win today & a picture of him after his race! This is just one of the many cases where we can show that injured dogs do not have to end up with the fate that the 'other side' would lead people to believe. We love these dogs & these dogs love to run. Gene is back doing what he loves to do with the people that love and adore him - us. So that's our feel good story today... We hope that seeing his win can bring a smile to your faces the way that it did for us!! Approving the bill in a 46-2 Senate vote, Iowa's Horseshoe Casino in Council Bluffs & Mystique Casino in Dubuque would no longer be required to subsidize money to the greyhound racetracks associated with each casino. This is truly unfortunate for those wishing to remain in Iowa's greyhound racing industry. Jerry Crawford, attorney for the IGA, was quoted saying: "Those casinos, which are very valuable properties, worth hundreds of millions of dollars, wouldn't exist if we hadn't provided the votes to get them their licenses. And the agreement was that in exchange for our support, they would support greyhound racing forever." According to the bill there would be a $92 million payout. The casinos would get $20 million to support the upcoming greyhound racing season. $36 million would be provided to those business owners wishing to retire from the industry as well as aid with the care & adoption of greyhounds who no longer will have a track to compete at. The remaining $36 million would go to those who want to stay in greyhound racing business at Dubuque. Gov. Terry Branstad who recently called greyhound racing a dying industry also said he supported closing the racetracks, as long as the people who work in the racing industry were compensated. Derby Lane Greyhound Racing Tri Super jackpot currently stands at $22,300.92 and growing! Play this afternoon in Races 5 and 7. Orange Park Kennel Club Tri Super jackpot currently stands at $14,085.04 and growing! Play this afternoon in Races 6 and 8. Gulf Greyhound Park Late Tri Super jackpot currently stands at $14,833.00 and growing! Play this afternoon in Races 12 and 13. Contrary to rumors... Dubuque Greyhound Park (known as Mystique) is gearing up for Opening Day, this Saturday April 26th! Looking for a way to give back to the Greyhound Racing Community? Jewelry designer Serena Soares has come up with a greyt way to help Greyhound Pets of America! She is selling these cute & clever earrings for just $15 and ALL proceeds go to GPA to help support the greyhounds in their care until they find their forever homes. To top it off price includes shipping! We love this story of how the Lyman High School Greyhound Football team will have a footrace against 7 actual Greyhounds at the Sanford Orlando Kennel Club, Thursday May 1st! Located across the street from each other on Dog Track Road in Longwood, Florida, Lyman High became the Lyman High Greyhounds after track owners donated uniforms to the football team back in the 1950's. Mike Newlin, Sanford Orlando's General Manager & Jeff Gierke, Lyman Head Football Coach created the idea together and last year the event helped raise more than $500.00 for local Greyhound Adoption programs. The Coach & team see the upcoming race as a greyt way to kick off spring football and have the team give back to the community... And we couldn't agree more! Another Week, Another Record Broke at Abilene! One week after breaking the 5/16 track record at Abilene Greyhound Park, the same pup PJ Refined has once again re-set the record! PJ Refined posted a 29.36 time on April 8th, re-setting her own mark of 29.41 established on April 1st! She is owned by Jay Rangel and Paul Bitterman and a January 2013 daughter of PG Tiger Greys Ricochet. Scheduled to compete in the NGA Track Stakes in a little over a week, PJ Refined will also be competing with many other pups from the Rangel Kennel in Abilene at the NGA Spring Meet happening April 21st-26th. Definitely one to watch! In your own words, tell members of the Florida Senate and the Florida House how important Live Greyhound Racing is to YOU and your Family! Require ALL Greyhound Tracks to maintain proper Track Surface (the University of Florida Vet School can help in developing this standard. Require ALL Greyhound Tracks to install a safety device to remove the lure (the mechanical arm the Greyhounds chase around the track) from the racing service by remote control that has been very successful in avoiding injuries. Require ALL Greyhound Tracks to insulate the rail in the middle of the Track that is currently exposing 240 volts to people and animals. Tune into www.BigJackpotBetting.com this Friday, 5pm Eastern, when FGA President Jim Blanchard joins us to explain exactly what happened and what's next after the big win in Tallahasse on Tuesday. Lee Opera Wins 2014 James J Patton Silver Cup! Lee Opera dominates with flawless performance on the Patton Silver Cup! It wasn't too much a surprise seeing that she was the betting favorite in this final round. This win solidifies her as among the best not only at Orange Park but around the country! 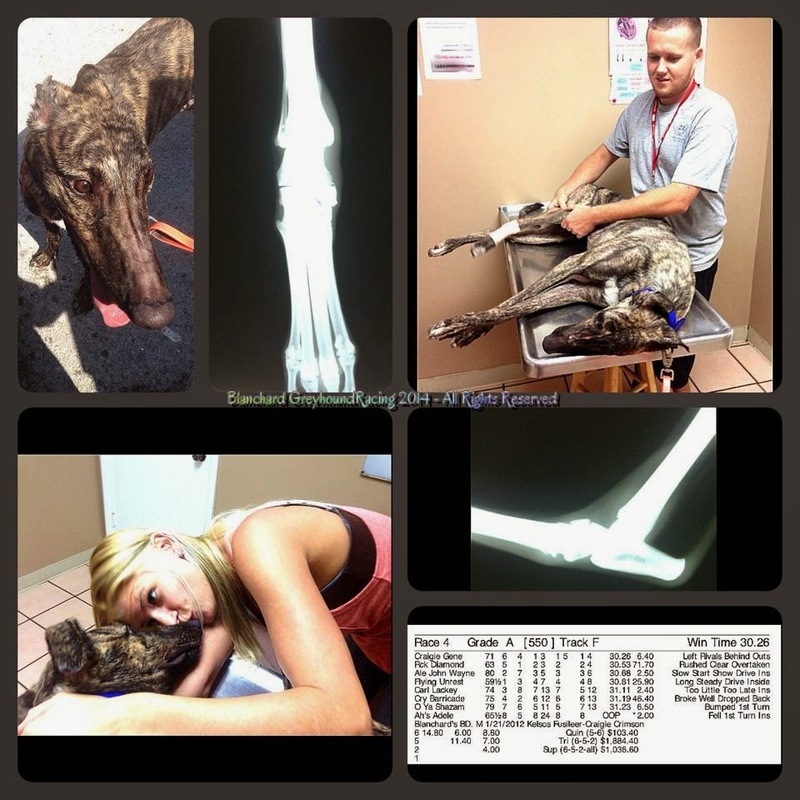 Florida Greyhound Association Pres. Jim Blanchard says it's vital for those in greyhound racing to spend as much of the day in Tallahassee--to attend the hearing, to visit with key legislators beforehand and to basically deal with the vital legislative issues at hand. "We're being singled out," Blanchard said, "and we've got to make our voices heard. And we need to do that on Tuesday." Alysia Arnhold of Hays, KS and daughter of greyhound breeders Bruce & Darlene Arnhold was awarded the $1,000 Edward Keelan III Memorial Scholarship. This scholarship honors the memory of track owner/operator Ed Keelan. Tito Jose Canas of Wheeling, WV and nephew of NGA member Ricardo Pacheco, who also trains for Vince Berland Kennel, was awarded the $1,000 Jason Dean Hunt Memorial Scholarship. This scholarship honors the memory of U.S. Army Spc. Jason Hunt who was the son of greyhound breeder Gale Hunt and grandson of Hall of Famer Kay Smith. About Me: Sort is a good-looking boy. He is well-behaved, not rowdy and friendly. About Me: Brake is an lovable, enegetic, and has never met a stranger. About Me: Simon is a handsome boy with a unique brindle pattern with a bright red undercoat. He's friendly and outgoing. A super nice boy. About Me: Impact is a petite, lovable, friendly black girl. She's back at IAGA thru no fault of her own.